Jayson McDonald in Underbelly at the 2012 Vancouver Fringe Festival. 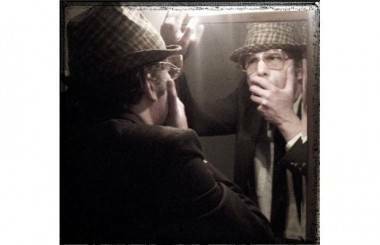 Underbelly is a one-man show inspired by the life of William S. Burroughs and the 1950s beat poets. I cannot find words for how beautiful this show is. Underbelly is a look into the void. Of consciousness, existence, and human interaction. The central tension of the show lies in looking for meaning in chaos. Chaos in the world, communication between people, and chaos within the individual being. What is life? What is freedom?, the show asks. The Europeans had the Existentialists, North Americans have the Beats. To understand Underbelly, some context will help. The middle of the 20th century was a dark time to live in. The invention of the atomic bomb and the tension between two superpowers intent of the other’s destruction caused anxiety for people hoping to invest in their future. If there was likely to be no future, what was there to invest in? The audience is then introduced to one of the central ideas of Underbelly: how does an individual make decisions in a world where conventional morality is nothing more than another politician with a fake smile and a fat bank account? Without an anchor, what is reasonable, what is just, and how to speak in a common language? “We are all alone, but at least we are all alone together.” Drugs are just a way to enjoy the chaos more. Some people will walk in and only see a man onstage portraying a series of hallucinations. They will feel the cynicism of a man wondering what he has to live for. But make no mistake, there is heart in Underbelly. “Love is the greatest painkiller of all,” says the main character at the end of the show. The statement is an offering to the void, and the only words that the playwright, Jayson McDonald, borrows from Burroughs in the entire script. Beautiful production, beautiful script. Sad, subtle, and very, very funny. If you’ve ever felt dissatisfied by life, see this show. Make sure you sit in the front row. Tomorrow, Sunday Sept 16, is your last chance to see Underbelly with the 2012 Vancouver Fringe Festival. The show is at 6:45 at the Waterfront Theatre. For tickets go here. This entry was posted in events, the latest and tagged Vancouver Fringe Festival. Bookmark the permalink.